As the prospects for some sort of “cap and trade” legislation still loom, many supply chain managers are still uncertain as to how such new regulations would play out in practice. In general, with a cap-and-trade system, the government sets a cap on carbon emissions that will be released into the atmosphere over a certain period (e.g., annually). That “cap” is then divided into individual permits to release a specified amount of CO2. Below, we look at an example of how a cap-and-trade program might work in practice, based on materials from Dr. Stephen Polasky of the University of Minnesota. This example is taken from a recent report from TheGreenSupplyChain.com on cap-and-trade versus carbon taxes. That report can be downloaded here: Preparing Supply Chains for the Green Future: Understanding Cap-and-Trade Versus Carbon Taxes. 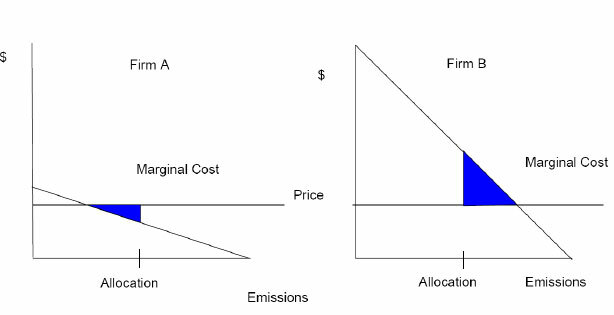 Over time, emission sources will trade to a point at which the marginal costs of reducing emission are equalized between internal options and buying permits on the market. Consider two companies, A and B, each of which now emits four “units” (however that is defined) of CO2, or eight units between them. Requiring the two companies to reduce emissions by 50% would result in four units being eliminated, and four remaining. That could be “enforced” by allocating only two units to each firm. 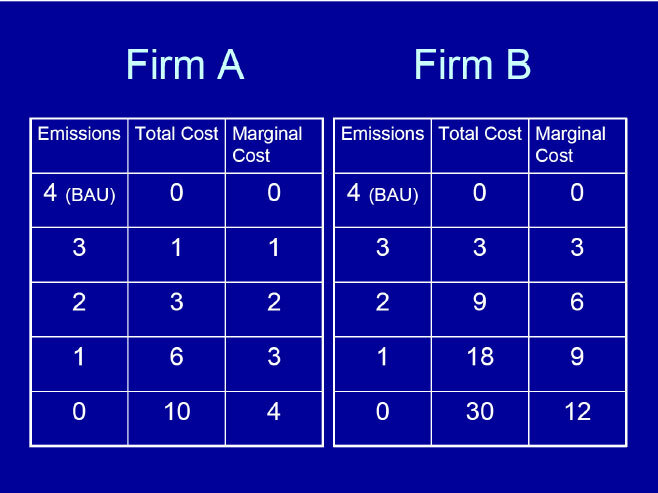 Let’s further say that it is three times as costly for company B to reduce its emissions than it is for company A, based on each company’s current technology or other factors – and that the costs rise (per unit) the more units you attempt to reduce, as shown in the chart below (i.e., the “marginal cost” for each unit of decrease goes up – as almost always would be true in practice). As shown below, if no trading were allowed, it would cost firm A $3.00 to meet the cap, and firm B $9.00 – meaning it costs $12.00 between them. However, trading is, by definition, allowed under a cap-and-trade system. So, because Firm A can sell one of its “permits” at a higher price than the cost it would incur to reduce the emissions internally, it will sell one permit to B for, say, $5.00 - $1.00 less than the marginal cost ($6.00) for firm B to reduce its emissions internally. Over time, emission sources will trade to a point at which the marginal costs of reducing emission are equalized between internal options and buying permits on the market. That is because companies will pursue the lowest cost means of obtaining the cap. It is critical to understand, however, that firm A has also pocketed $4.00 in revenue from this deal (absent any cost to begin with for acquiring the permits) – in effect, giving it a profit of $3.00 on the whole deal. This potential for “windfall” profits is one of the many concerns over cap and trade. What type of impact do you think cap-and-trade legislation would have on supply chains? Let us know your thoughts at the Feedback button below.